Cathy Hughes, also informed the National Assembly on Wednesday about plans for various departments which fall under her purview. 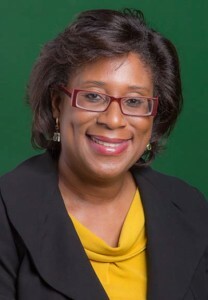 She noted that the National Frequency Management Unit (NFMU), of which she has control over, transferred some $700M to the Consolidated Fund in 2015. Hughes also noted that for last year, the NFMU carried out a range of its mandated functions such as Radio Inspection, Monitoring, Licencing and Number Administration. The Public Telecommunications Minister said that the agency reviewed the proposed Memorandum of Agreement between the Governments of Guyana and India on the Centre of Excellence for Information Technology and made recommendations for its enhancement. Hughes said that the NFMU also spearheaded the procurement of emergency telecommunications equipment for the Civil Defence Commission, through a grant from the International Telecommunications Union (ITU). The Parliamentarian said, too, that the unit also made a direct impact in fostering and promoting gender balance in the industry through its “Girls in ICT Day Activities” which is a programme that seeks to encourage more female participation in the ICT sector, and which is a staple in the NFMU’s calendar of activities. In 2016, the Minister said that the National Frequency Management Unit will continue preparation for the liberalization of the Telecommunications Sector, and upgrade spectrum monitoring and management capabilities. She said that the agency will support further development and deployment of Broadband networks/services; continue participation in the Harmonized Caribbean Spectrum Planning and Management Project; continue promoting and supporting the use of ICTs for Disaster preparedness/mitigation; and promote the use of ICTs to achieve the United Nations’ 2030 Sustainable Development Goals in Guyana. Minister Hughes said that the Unit will intensify the process to transition from Analogue to Digital Terrestrial Television Broadcasting. She promised that public consultations will be held to discuss the roadmap for the transition and choice of digital standard will be carried out. Hughes told the National Assembly that 2016 will see commencement of the implementation of the Roadmap. Further, the politician said that the NFMU will plan, organize and execute activities to raise the awareness regarding opportunities and encourage more females to consider careers in the ICT field. She said that the Unit will continue working with organizations such as the Ptolemy Reid Rehabilitation Centre to promote the use of ICTs for differently-able persons. The Minister also stated that the NFMU will also Re-Tender for and commence the building of its Head Office. The National Data Management Authority (NDMA) is another agency within the Public Telecommunications Ministry. Under the supervision of its newly-appointed board, Hughes said that the NDMA will develop work programmes to satisfy its mandate. She said that the NDMA, which is the government agency responsible for data processing and information systems in the Public Sector, will focus on improving the Public Sector’s Information and Communication Technology (ICT) preparedness. Towards this end, the Minister said that the Authority will be revamped to better support the eGovernment Unit and the ministry in its ICT capacity development. In addition, Hughes said that the NDMA will continue to provide data processing services and will monitor and review plans of the various ministries with the aim of determining its data processing requirements, and based on these findings; provide guidance, advice and direction where necessary.